For a while now, it’s been becoming less like a state highway for cars, and more like a vibrant, urban street for people. Yet it’s far from the pedestrian paradise that WalkDenver, the city’s preeminent pedestrian advocacy group, envisions. The group has long focused its attention on the city’s most colorful street — and one of its most dangerous for pedestrians — and will continue to do so with an event tonight at the SIE FilmCenter. 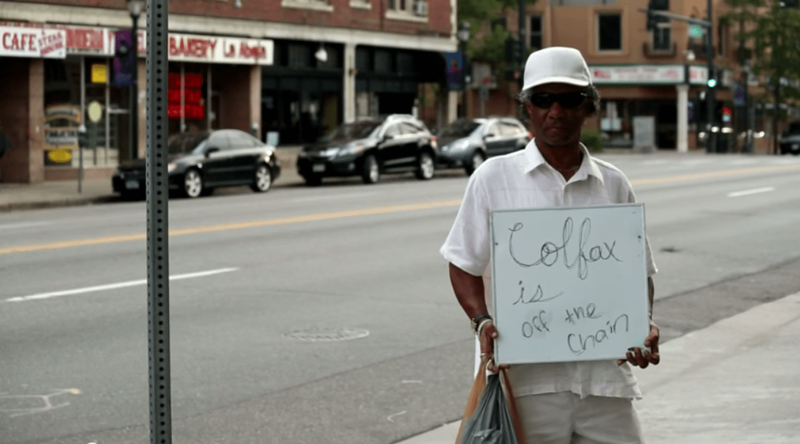 “I Walk Colfax” is a party, but WalkDenver hopes it’s the beginning of a change in policy, too. Thursday’s event is the official launch of its People on Colfax Initiative, which aims to demonstrate to city decision makers like Mayor Michael Hancock and his Department of Public Works that Colfax Avenue is a place for living, breathing people, not just cars. So what does Colfax need most? One new traffic signal is planned for East Colfax and Steele Street which will slightly improve a five-block dessert of crosswalks. Still, Colfax sometimes goes six blocks without a place to safely cross the four-lane strip (see Colorado Boulevard to Cherry Street). Since walking an extra 10 or 15 minutes to get to a destination directly across the street isn’t human nature, people cross halfway and stand in the center turn lane (also known as a “suicide lane”). Or they just run across, trying to beat speeding motor vehicles. WalkDenver wants to make the case that this isn’t OK, and they have the backing of neighborhood groups and local businesses. If the city’s decision makers don’t make Colfax a better place for pedestrians, it’ll be because they chose not to listen. You can buy tickets to Thursday’s event here, and at SIE FilmCenter, 2510 E. Colfax, tomorrow during the event. The parking meters need to be more narrowly spaced. The streetlight and trees need to be moved off the sidewalks and into bulbouts in the parking lanes. The situation between Monroe and Garfield is particularly ludicrous. Bulbouts are needed all over the place — pretty much anywhere there is a no parking any time sign. What else is that bit of street for? Floating parking for protected bike paths need to be added on many side streets, which have absurdly narrow sidewalks. Pedestrian islands are needed in the suicide lanes in many places, for example at Adams. (The thing at Kearney is good). Left turn lanes should be shortened and replaced by wider sidewalks (and curved lanes in many places.The crosswalks should always be perpendicular to the curb, not diagonal, better marked and half again as wide. The car accesses of many businesses are too wide — the lower curb area should be narrowed and better marked. Humboldt and Franklin Street should be close to car traffic between 16th & Colfax. City Park Esplanade should allow traffic on one side of the meridian only, and the Elizabeth street semicircle should be made pedestrian only, or a park. Ditto Monaco and Del Mar. Buildings with setbacks should be discouraged, as should building with no streetside entranceway. Some 4 storey building with smaall box retail in the ground floor and apartments or offices above should be developed. A good place would be at the U CO hospital Anschutz, which is a crime against the city. 14th & 16 should get bike paths.